Thank you for the welcoming and comforting home away from home. We will be back soon. This is a great little getaway spot. My boyfriend and I planned a random trip Friday afternoon. I was a little anxious about check in and everything so I called but they were actually calling me at the same time. 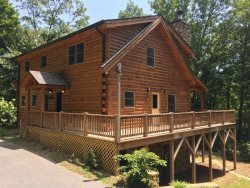 Communication about the property was clear and they sent additional directions to get you up to the cabin. The drive up to the cabin is pretty narrow and steep in places so I wouldn't recommend driving a huge truck or anything. Parking was a little weird as well but fine. The view and the cabin were totally worth it either way! The cabin is exactly as seen in the pictures. There is a hot tub area to the side of the cabin. It was clean and relaxing. We didn't explore too much around the cabin but we did in town and surrounding areas. The downtown area of Bryson City it very quaint and has lots of neat shops to explore. We went to Cherokee, which was about a 20 minute drive and did some hiking. There was a ton of other options to hike, bike, etc within a 30 minutes drive. Highly recommend and we will definitely be repeat customers! We enjoyed our time in Bryson City. The cabin was great. Easy to get to and secluded. Unexpected gas grill was a plus. Will definitely try to get back during the season for a rafting trip. This was our first year here at Deep Creek Fishing Cabin. We truly enjoyed our family weekend here. It was perfect place for our family. We enjoyed the privacy and location for our family Winter vacation. The cabin is very nice and the hot tub was amazing to enjoy at night under the stars. Thank you. 3rd year in the cabin! Great visit to the Polar Express, train Museum and the hot tub. Can't wait till next time. Very wonderful, helpful and just all around great. We had such a WONDERFUL time at Deep Creek Fishing Retreat! Thank you so much for the great accommodations! We hope to come back every year. Everyone was extremely nice. I felt like I knew everyone personally. We had a great stay. Lovely cabin and decor. Thank you so much for letting us stay at this beautiful cabin. Friendly and helpful. Appreciated the ease of check in and out. No driving to an office somewhere to fill out more paperwork and get or turn in a key. We had a relaxing time staying here. The cabin was clean and comfortable and we appreciated all of the cute decorative touches. Really enjoyed the seclusion of this cottage, while still only minutes to the park entrance and town. Fathers Day away in the wilderness. But I still like my creature comforts and the cabin was just right.